If you thought high oil prices were just a blip think again - Venezuelan President Hugo Chavez has ruled out any return to the era of cheap oil. In an interview with BBC Newsnight's Greg Palast, Mr Chavez - who is due to host the Opec meeting on 1 June in Caracas - said he would ask the oil cartel to set $50 a barrel as the long term level. During the 1990s the price of oil had hovered around the $20 mark falling as low as $10 a barrel in early 1999. "We're trying to find an equilibrium. The price of oil could remain at the low level of $50. That's a fair price it's not a high price," Mr Chavez said. He will have added clout at this Opec meeting. Analysis by the US Department of Energy (DoE) - seen by Newsnight - shows that at $50 a barrel Venezuela - not Saudi Arabia - will have the biggest oil reserves in Opec. 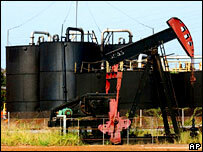 Venezuela has vast deposits of extra-heavy oil in the Orinoco. Traditionally these have not been counted because at $20 a barrel they were too expensive to exploit - but at $50 a barrel melting them into liquid petroleum becomes extremely profitable. The DoE report shows that at today's prices Venezuela's oil reserves are bigger than those of the entire Middle East - including Saudi Arabia, the Gulf states, Iran and Iraq. The US agency also identifies Canada as another future oil superpower. Venezuela's deposits alone could extend the oil age for another 100 years. The DoE estimates that the Venezuelan government controls 1.3 trillion barrels of oil - more than the entire declared oil reserves of the rest of the planet. Mr Chavez told Newsnight that "Venezuela has the largest oil reserves in the world. In the future Venezuela won't have any more oil - but that's in the 22nd Century." He will ask the Opec meeting in June to formally accept that Venezuela's reserves are now bigger than Saudi Arabia's. Mr Chavez's increased muscle will not go down well in Washington, which is deeply opposed to his government. Ironically, by invading Iraq, George W Bush has boosted oil prices and effectively transferred billions of dollars from American consumers to the Venezuelan government. Up to $200m a day - half of it from the US - is flooding into Caracas. Mr Chavez is spending this on building infrastructure and increasing the minimum wage and improving health and education in the poor ranchos which surround the cities. As a result even his opponents accept that Mr Chavez is extremely popular and will easily win the next presidential election in December. Mr Chavez is also spending billions in the rest of Latin America - exchanging contracts for oil tankers and infrastructure projects and buying up debt in Argentina and Brazil. He has made cheap oil deals with Ecuador and the Caribbean. He has also spent some of the dollars which have come in from the US to support Fidel Castro in Cuba. In return Cuba has supplied the thousands of doctors and teachers who are transforming conditions in the barrios of Caracas. Washington accuses Mr Chavez of buying influence in Latin America. The Venezuelan president has repeatedly won democratic elections and the opposition operates freely although some members have been charged with accepting illegal foreign donations. Nonetheless Bush's administration repeatedly targets Mr Chavez on human rights and finances his opponents. Earlier this year, US Defence Secretary Donald Rumsfeld compared Mr Chavez to Hitler - because he was elected democratically. Mr Chavez told Newsnight he was still concerned that Mr Bush had not learned the lessons of Iraq and would order an invasion to try to secure Venezuela's oil. "I pray this will not happen because US soldiers will bite the dust and so will we, Venezuelans," he said. He warned that any such attempt would lead to a prolonged guerrilla war and an end to oil production. "The US people should know there will be no oil for anyone." 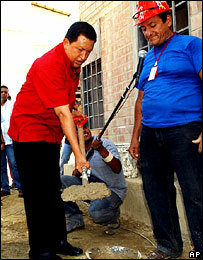 Mr Chavez does not accept UK Prime Minister Tony Blair's criticism of him for lining up with Mr Castro. He told Newsnight: "If someone is sleeping together it is Bush and Blair. They share the same bed." Greg Palast's interview with Hugo Chavez kicks off Newsnight's Latin American Season on Monday night at 2230 (BBC Two).